"Marčiulionis" redirects here. For the basketball player active in the 2000s, see Kęstutis Marčiulionis. Raimondas Šarūnas Marčiulionis ([ˈrɐ̂ˑɪ̯mɔndɐs ʃɐˈrûːnɐs mɐrʲtɕʊˈlʲôːnʲɪs] ( listen)) (born June 13, 1964) is a Lithuanian retired professional basketball player. Widely considered as one of the greatest international players, he was one of the first Europeans to become a regular in the National Basketball Association (NBA). On August 8, 2014, Marčiulionis was inducted into the Naismith Memorial Basketball Hall of Fame, and became a member of the FIBA Hall of Fame in 2015. In the 1988 Summer Olympics, together with teammate Arvydas Sabonis, Marčiulionis led the senior USSR national team to the gold medal. With the senior Lithuanian national team, he won two Summer Olympics bronze medals, in 1992 and 1996. He was an All-Tournament Team member, the top scorer, and the MVP of the EuroBasket 1995, and he was also elected to the All-EuroBasket Team in 1987. Marčiulionis is credited with bringing the Euro step move to the NBA. Marčiulionis was the second son of Laimutė, a geography teacher, and Juozas, an engineer. Given that Laimutė aggravated her spinal injury, while giving birth to his sister Zita, her determination in having a son led to the middle name Šarūnas, invoking a legendary knight from Vincas Krėvė-Mickevičius's works. Growing up in Kaunas, Marčiulionis took up tennis while growing up, being an ambidextrous player, focused on forehands. Given his unorthodox technique, and an increasingly bulky frame, he eventually gave up on the sport. While Marčiulionis attended college, he rarely played basketball, but he eventually attracted a scout from Statyba, of the USSR Premier League, in 1981. He would play with Statyba, in the USSR League, from 1981 to 1989. During a 1985 game against Athletes in Action, in Vilnius, Marčiulionis struck a friendship with one of the opponent players, Donnie Nelson, despite the language barrier. 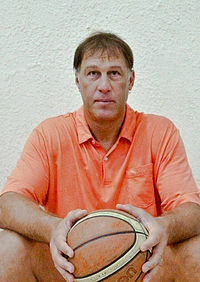 Nelson's father, Don Nelson would later be the head coach of the Golden State Warriors, and what he said about Marčiulionis' skills led the Warriors to draft him, in the 6th round of the 1987 NBA draft. Stan Kasten, president and general manager of the Atlanta Hawks, managed to void the pick, by showing Marčiulionis was age 23, one year older than the age the draft rules limited for European players. The Hawks then pursued Marčiulionis using then-owner Ted Turner's connections with the Soviet Union, inviting him and other Soviet players to their training camp, and arranging for Hawks-USSR matches in Moscow, in 1988. While Marčiulionis signed a contract with Atlanta, the day after he won the gold medal in Seoul, the team wound up not submitting it to the National Basketball Association's offices, as the Soviets said they would not permit the player to leave. Eventually, Nelson's influence helped Marčiulionis with his social projects in Vilnius, and led him to remain with the Warriors, with whom he signed a three-year $3.8 million contract, in 1989. Marčiulionis became the first Soviet player to join the North American league, and played four years with the Warriors, finishing as the runner-up for the Sixth Man of the Year Award in 1992. Marčiulionis became one of the first Europeans to get significant playing time in the NBA, helping to lead the way for the internationalization of the league in the late 1990s. After missing a year-and-a-half with a leg injury, he was traded to the Seattle SuperSonics, in 1994, then traded to the Sacramento Kings, in 1995, and he finished his NBA career with the Denver Nuggets, in the 1996–97 season. In 1982 and 1983, Marčiulionis played sparingly with the Soviet juniors, and he won a silver medal at the 1983 FIBA Under-19 World Cup, in Spain. Marčiulionis was frequently the last man cut from the senior Soviet Union national basketball team training camps, until he finally got his chance with the senior team in 1987, having a breakout performance, while winning a silver medal at the EuroBasket 1987. Marčiulionis would also be one of the standout players, as the Soviets won the gold medal at the 1988 Summer Olympics. Following the restoration of Lithuanian independence, in 1990, Marčiulionis almost single-handed resurrected the senior Lithuanian national team. He contacted prospective players, encouraged several to join, selected the uniforms, negotiated a shoe deal, and arranged for sponsorships, along with friend Donnie Nelson. Sponsor deals struck by him included Bank of America and the rock band Grateful Dead, who were interested in supporting Lithuania, after reading a story on Marčiulionis and the national team, in the San Francisco Chronicle. The Grateful Dead also helped launch a line of tie-dyed jerseys, that would feature Lithuania's national colors, along with a slam dunking skeleton, created by New York artist Greg Speirs. Speirs became a major sponsor, when he donated 100% of his profits from his design, to fund the team, and to Lithuanian children's charities, amounting to at least $450,000. The team went on to win a bronze medal at the 1992 Summer Olympics. Marčiulionis was again a bronze medalist with Lithuania, at the 1996 Summer Olympics. In 1995, he was named the MVP of the 1995 FIBA EuroBasket, after leading Lithuania to a silver medal in the tournament. In 1987, 1989, 1990, and 1991, he was voted the best sportsman in Lithuania. Even with language barriers, Marčiulionis was a devoted teammate, and active in the communities he played in. In 1987, he helped a Panevėžys man get an artificial heart valve for his son, by appealing to Donnie Nelson, who arranged an operation for the teenager in the United States. In the aftermath of the 1989 San Francisco earthquake, Marčiulionis appeared at the site of a commuter train accident, wearing his Warriors warm up outfit, and he helped by pulling out trapped passengers and administering first aid. His wife Inga, enrolled at Merritt College, a junior college in the Oakland hills, and she walked on to their women's basketball team, and was a star player there for two seasons. Inga became one of 147 women in women's college basketball history, to score 50 or more points in a college game, while at Merritt, and today is the head coach of Merritt's women's team. Marčiulionis and Inga are divorced; Inga continues to live in the United States, and continues her work at Merritt College. Marčiulionis married Laura Mikelionytė on March 10, 2012. In 1992, Marčiulionis opened the Šarūnas Hotel in Vilnius. In 1993, he founded the Lithuanian Basketball League (LKL), and also became its president. In 1999, Marčiulionis founded the North European Basketball League (NEBL), and also became its commissioner. The NEBL would later be absorbed into today's Baltic Basketball League. Today, he is one of the most successful businessmen in Lithuania. He was also the President of the Šarūnas Marčiulionis Basketball Academy. On February 14, 2014, Marčiulionis was announced as a 2014 player inductee, by the Naismith Memorial Basketball Hall of Fame; he formally entered the Hall on August 8. On September 19, 2015, Marčiulionis was inducted into the FIBA Hall of Fame. On October 2, 2015, it was announced that Šarūnas Hotel was closed. The nearby Šarūnas Marčiulionis Basketball academy meanwhile, was closed after the 2015–16 season. ^ Abrams, Jonathan (November 17, 2010). "An N.B.A. Move That Crossed an Ocean". nytimes.com. Retrieved August 30, 2018. ^ "NBA Imports: The "Euro Step" Moves To North America". ESPN.com. November 22, 2010. Retrieved August 30, 2018. ^ Cohen, Ben (August 9, 2018). "One Eurostep for Manu. One Giant Leap for Mankind". Wall Street Journal. Retrieved August 30, 2018. ^ a b "Jenkins: Marciulionis' Impact Goes Beyond Basketball - Golden State Warriors". Retrieved November 13, 2018. ^ a b c d "'I Have To Open People's Eyes'". Retrieved November 13, 2018. ^ a b Jonge, Peter de. "A Soviet Hoopster In the Promised Land". Retrieved November 13, 2018. ^ "Warriors Sign Marchulenis, First NBA Soviet". Los Angeles Times. June 25, 1989. Retrieved May 28, 2016. ^ "Marciulionis, Houston Are Traded for Pierce, Rogers". Los Angeles Times. July 19, 1994. Retrieved May 28, 2016. ^ "Sonics Trade Houston, Marciulionis To Kings". Seattle Times. September 18, 1995. Retrieved May 28, 2016. ^ "PRO BASKETBALL;Nuggets Trade Abdul-Rauf, Acquire Pacers' Jackson". New York Times. June 14, 1996. Retrieved May 28, 2016. ^ "Raimondas-Sarunas MARCIULIONIS". Retrieved November 13, 2018. ^ Woolf, Alexander (2002). Big Game, Small World: A Basketball Adventure. New York City: Warner Books. p. 20. ISBN 0-446-52601-0. ^ Alan Siegel. "Remembering The Joyous, Tie-Dyed All-Stars Of The 1992 Lithuanian Basketball Team". Deadspin. Retrieved January 3, 2016. ^ "Dead head art scores". USA Today. June 23, 1993. 2C. ^ John Clarke. "Doc Outs Olympic Dream Team". Forbes. Retrieved January 3, 2016. ^ "Kelley: Playing for more than a prized gold medal". Retrieved November 13, 2018. ^ "Tie-Dyed Lithuanian Slam-Dunking Skeleton® Back for "The Other Dream Team" Documentary". The Lithuania Tribune. Archived from the original on February 21, 2016. Retrieved January 3, 2016. ^ Goldaper, Sam (December 4, 1990). "King Renegotiates His Own Contract". The New York Times. Retrieved March 27, 2010. ^ Smith, Michelle (December 27, 2001). "Cal's Volkova making progress". The San Francisco Chronicle. ^ "Šarūnas Marčiulionis vedė savo mylimąją Laurą Mikelionytę". Žmonės.lt (in Lithuanian). Retrieved May 29, 2018. ^ Woolf, Big Game, Small World, pp. 19–20. ^ "heinnews – Marčiulionis gives back in more ways than one". heinnews. Retrieved January 3, 2016. ^ "2015 Class of FIBA Hall of Fame inducted". FIBA.com. September 19, 2015. Retrieved October 18, 2015. ^ "Užrakina "Šarūno" viešbutį" (in Lithuanian). Delfi. October 2, 2015. Retrieved May 26, 2016. ^ "Sostinėje nėra vietos krepšiniui: garsenybės kūdikį pakeis daugiabučiai" (in Lithuanian). Delfi. November 26, 2015. Retrieved May 26, 2016.